If you have ever wondered why it is that the United States government has enacted seemingly suicidal policies, then please prayerfully ponder the information contained below. Without this information, much of what is done by the federal government will seem simply incomprehensible. Once you realize how deeply Rome has influenced our government for the purpose of creating chaos and ruin, the reasons for the present self-destructive policies of our government will become clear. If you study the history of the very powerful Roman Catholic Church, you will start to get a glimpse into how they have operated historically and what their plans are for our future. I have studied the Roman Catholic Church and their militant Jesuit order from both an historical and Scriptural perspective, and their histories are both bloody, and from a Scriptural perspective, beastly and satanic. For those in the pro-life ministry, do not be deceived into believing that the Roman Catholics are your partners the effort to bring an end to abortion, as the bloodiest acts of Roman Catholic aggression have occurred at times of apparent cooperation and peace with the RC church. Non-Catholics were lulled into a sense of false security and then viciously attacked by the RC church in bloody massacres such as in Ireland in 1643 when RC militants killed 40,000 Protestants in needlessly brutal and savage ways –unborn babies cut from their mothers’ wombs and fed to dogs while husbands were forced to watch. Such will happen to all who look to the Papacy for friendship. In the 20th century, the Papacy was instrumental in orchestrating the communist take-over of Russia to eliminate the rival Russian Orthodox Church. Similar campaigns were undertaken in Serbia and Germany. All were grotesquely and needlessly bloody. Do your homework! If you believe that these bloody acts of aggression are behind us, then I implore you to think again. Once Roman Catholic agents in our government are politically and “legally” able to do so, believe the sobering reality that the massacre will be begin again. If you think that I am being a paranoid alarmist, then I implore you to do research on this topic and challenge you to reach a different conclusion. Ponder how history is repeated. This sobering reality is one of the reasons that I so ardently plead with all who will listen that it is imperative not only for our eternal salvation but also for our very lives today and the lives of our children tomorrow that each of us in this country place ourselves under humble obedience to our Creator’s code of ethics, obeying His commandments, rejecting the false theologies hatched by the Roman Catholic Church. Keep Yah’s Sabbaths and reject the beastly holydays Easter, Christmas, and other Babylonian inventions adopted by Rome. Demand that beastly icons of Babylonian and Roman idolatry such as the Washington Monument and the Statue of Liberty be torn down. In short, the time for repentance is now. Otherwise, just as the Babylonian beast sacked and exiled Israel at the time of JeremiYAH the prophet, so the beast of today Rome will do the same to you. Don’t believe it to be impossible! The United States Army Reserve is already recruiting soldiers to attend to concentration camps here in the United States. Do not think for a moment that you can fight against the beast Rome and win. Your only hope is to cry out to Yah in repentance. Resolve today to keep His commandments so that you and your children may live. Do it for your life. Do it for your family. Do it for your children. Do it now. The following is an excerpt from an informative email from Steve Lefemine. "It is under the inspiration of those diabolical laws of Rome, that 75,000 Protestants were massacred, the night and following of St. Bartholomew." "In France the Protestants, called "Huguenots," were gaining wealth and political power. Admiral Gaspard de Coligny was their leader. The Jesuits with that she-wolf, Catherine de Medici, [ Catholic ] Queen Regent of France, plotted their destruction. On August 24, 1572 the murderous frenzy began. Admiral Coligny bravely resisted his assassins but to no avail. He was murdered and his head was sent as a trophy to the [ Roman Catholic ] Cardinal of Lorraine who had been educated, or rather brainwashed, by the Jesuits in Flanders. Rome celebrated, struck a coin commemorating the "great victory" and sang her "Te Deums." Vatican Assassins, by Eric Jon Phelps (June 2004 ed. ), pp. 108-111. The famous painting of the Saint Bartholomew's Day massacre in Paris on 24 August 1572 depicts scenes from the most notorious incident in the French wars of religion and one of the most striking examples of the extremes of religious intolerance in the age. The Huguenot (French Calvinist) painter, François Dubois is reputed to have been an eyewitness to the massacre of thousands of his fellow Huguenots on the streets of Paris. Painting by François Dubois, a Huguenot painter, ... "he depicts Coligny's body hanging out of a window at the rear to the right. To the left rear, Catherine de' Medici is shown emerging from the Louvre to inspect a heap of bodies." "There is no intelligent reader of French history who is not familiar with the steps taken by this perfidious queen regent [ Catherine de Medici ] after the admission of the Jesuits into Paris, to bring about the terrible Massacre of St. Bartholomew - an event so closely allied with others,of which they were the undoubted authors, that one must close his eyes not to see the evidences which point to their agency in that infamous transaction. They needed such bloody work to give them the mastery over France; although they have since then been more than once expelled in disgrace from French soil, they have returned again and again to torment her people, who still continue to realize, under their [ Third ] Republic, how unceasingly they labor for the entire overthrow of every form of popular government." "Dear truth-seeker [ as it applies ], do you see how a Cardinal working in conjunction with the Jesuits can be involved in the murder of a political leader ? [ As explained and demonstrated in "Vatican Assassins: Wounded In The House Of My Friends" ], in 1963, a Cardinal working in conjunction with the Jesuits was involved in the murder of an American political leader. The Cardinal was Francis Spellman, who had a special parlor (Room number three) at the Jesuit Novitiate of St. Isaac Jogues in Wernersville, Pennsylvania. The political leader was our President John Fitzgerald Kennedy (JFK), wounded in the house of his friends." "Francis Borgia, the 3rd Jesuit General (1565-1572), having been in secret counsel with the Monarchs of France, laid the plan for this mass-murder of the righteous French Protestant Calvinists including their great leader, Admiral Gaspard de Coligny. Pope Pius V, formerly "Brother Michael" the Inquisitor, exhorted both Queen Regent Catherine de Medici and her son, King Charles IX, "to punish the heretics with all severity, and thus justly to avenge not only their own wrongs, but those of Almighty God [sic]; to pursue and destroy the remnants of the enemy, and wholly to tear up not only the roots of an evil so great, and which had gathered to itself much strength, but also the very fibers of the roots ... Under no circumstances, and from no considerations, ought the enemies of God [sic] to be spared." This was done in obedience to the [ Jesuit ] Order's evil [ Counter Reformation ] Council of Trent [ 1545-1563 ], which to this day (2009) stands affirmed by the Second Vatican Council [ 1962-1965 ], having been neither repudiated nor renounced by either the Black Pope [ Jesuit General ] or the Papal Caesar [ Pope ]." Ridpath's Universal History, John Clark Ridpath, (New York: Merrill & Baker, 1901) Vol. XIII, p. 253. The Counter-Reformation in Europe, Arthur Robert Pennington, (London: Elliot Stock), 1899) p. 162. Repeating centuries of history, Rome has once again revealed its own dominion theology of primacy, and indeed, sole legitmacy, as the only true "church" on earth, in a document approved by the current false prophet occupying the antichrist Vatican, Pope Benedict XVI, on June 29, 2007. This blasphemous, perverted assertion is in fact just the opposite of the Truth. The false religion of Romanism is NOT Biblical Christianity, but is in fact a "Christianized" form of the ancient pagan religion of historical Babylon. 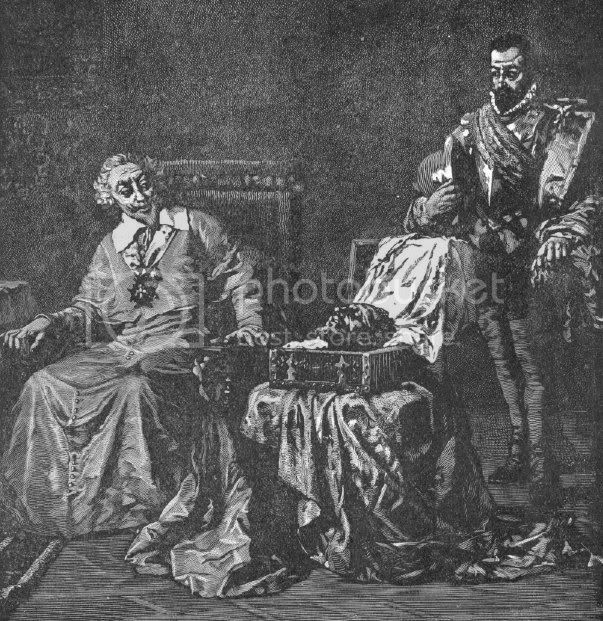 the Medicis sent his [ Admiral Coligny's ] head as a trophy to the Jesuit-trained [ Roman Catholic ] Cardinal of Lorraine pictured above. Ridpath's Universal History, John Clark Ridpath, (New York: Merrill & Baker, 1901) Vol. XIII, p. 255. The Saint Bartholomew's Day Massacre. When news of the Massacre reached the Vatican there was jubilation! Cannons roared­bells rung ­ and a special commemorative medal was struck­to honor the occasion! The Pope commissioned Italian artist Vasari to paint a mural of the Massacre ­ which still hangs in the Vatican! 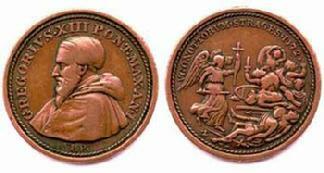 Medal struck by Emperor Gregory XIII (1572-85) to commemorate the slaughter of over 100,000 French Christians! !